The story of David Bowie’s remarkable life and music is nothing if not comprehensively and lovingly documented… Bowie in Bromley, Berlin-era Bowie… but what of East London Bowie? 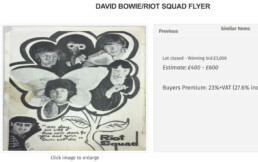 In 2004, reel-to-reel tapes – said to feature David rehearsing with ‘The Riot Squad’ in a Leytonstone flat – were listed at Bonhams with a guide price of £3000-5000. As Hammond player with The Riot Squad, Butch Davis vividly remembers the future Ziggy Stardust’s little-known stint with the Waltham Forest based band. ‘Well, yes he was – but not in 1967. Back then he was still learning his craft, on the cusp of greatness’. The Riot Squad have a complicated history, with fifteen separate lineups over the course of their five-year existence (Read Bruno Cerrioti’s exhaustive history for more on that). Before he joined, Butch remembers seeing their stickers ‘all over’ Walthamstow’s treasured Granada, having featured on several of the venue’s star-studded bills, with acts like The Yardbirds and The Kinks. Butch himself was performing in the foyer when The Beatles made their second appearance in October 1964. ‘The manager of the Granada came to us (‘Four Adams and Eve’) and said: “The Beatles are coming… as they walk up the stairs I‘d like you to be playing on the platform at the top”. 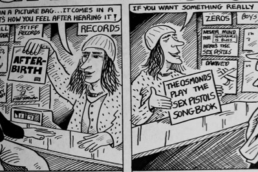 Butch and lead singer, Nero Gladman were soon poached by another local group, ‘The Chevrons’, although they were destined – in name at least – to be very short lived. Barely six months had passed when Bob Evans – by now the sole remaining original member of the recently disbanded ‘The Riot Squad’ – came to see them play in Edmonton. 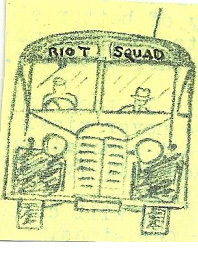 He clearly liked what he saw, and asked if they’d join him – en masse – to become the new ‘The Riot Squad’? And so what could be called the ‘Waltham Forest Riot Squad’ came into being with two Walthamstow boys, Butch from Cleveland Park Avenue and Terry Clifford (guitar) from Billet Road. Tottenham’s Del Roll was on drums along with Chingford boys, Rodger Crisp (bass) and Nero (vocals). In all The Riot Squad recorded over twenty sessions at ‘Meeksville Sound Limited’, Joe Meek’s legendary studio come home at 304 Holloway Road. They releasing four singles on Pye, the last of which ‘Gotta Be a First Time’ would prove to be Meek’s final single. Shocked and without a producer, the band split again with Nero, Rodger, and Terry leaving and Bob, Butch and Del holding auditions for replacements. ‘We were lucky to get a guitarist and a bass player really fast but we had great problems finding a singer. Band leader Bob Evans mind turned to a young singer called David Bowie, who he’d been impressed by when the Riot Squad supported his band, ‘The Buzz’ at the Marquee the previous summer. The pair met at one of David’s favourite haunts, ‘La Gioconda’, an Italian cafe in Denmark Street, Soho and despite having already signed a solo deal, Bowie agreed to help out. He’d been holed up recording his debut album and hadn’t played live for three months, so the Squad offered a chance to get out and experiment. Although it was to be strictly unofficial and his new manager didn’t need to know. 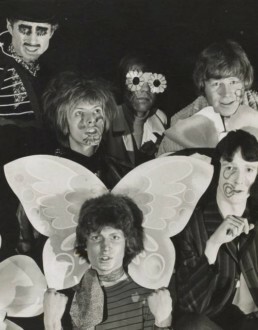 The new look Riot Squad made their debut, supporting Cream at a youth centre in Basildon on March 17th, 1967: ‘For a first performance, it was pretty good, supporting The Cream isn’t easy… you had Ginger Baker and Clapton to deal with. It was probably hard for David but he took it in his stride’. By then Bob Evans had moved from Walthamstow to a house in Wallwood Road, Leytonstone and the ‘new boys’ often stayed with him. The three spools of reel-to-reel tape listed at Bonham’s are recordings of rehearsals at the house, with the arm of the settee doubling as a drum. Anyone frequenting Waltham Forest circa 1967 may also recall the groups magnificent bullnosed Bedford Sun-coach – complete with built-in beds – crisscrossing between their Leytonstone HQ, Del in Tottenham, Butch in Walthamstow, and Cafe Rodi’s at Blackhorse Lane, Walthamstow, where Bob was a known worshipper of their lunches. Bathed in the blue from their ever-present flashing police light, The Riot Squad’s live performances became increasingly theatrical, egged on by Bowie’s magnetic presence upfront. Drummer Del Roll would alarm unsuspecting audience members by chomping down on a hidden blood capsule, soaking his white shirt in fake blood. On the cue of the now familiar but then virtual unheard refrain of The Velvet Underground’s ‘I’m Waiting For My Man’, Bowie would set about painting the band’s faces. His manager, Ken Pitt had met Andy Warhol in New York in late ‘66 and had been given an acetate of the not yet released Velvet Underground and Nico album, which he duly passed on to David. A lifelong infatuation with Reed was born and he returned to the song throughout his career but The Riot Squad’s live cover (and subsequent studio recording) was the first by anyone, practically before the album was even released! His love of American counterculture didn’t stop there, and he introduced the band to ‘The Fugs’ and Zappa’s ‘Mothers Of Invention’. They were duly added to the set, as the rest of the group gleefully embraced their switch away from a Tamla Motown sound. Bowie’s own composition, ‘Toy Soldier’ pilfered lyrics, melody and sadomasochism from The Velvet’s ‘Venus and Furs’ and Butch vividly remembers Bowie stalking a heavily padded Bob Evans round the stage, whip in hand, lashing him. 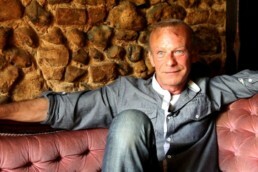 The recorded version features exaggerated whipping sounds and a plethora of other sound effects, added by sound engineer Gus Dudgeon – who went on to produce Elton John and of course Bowie himself. The pair had arranged to sneak into Decca’s studio for a hurried out of hours late night recording session. 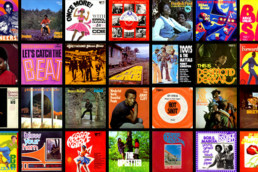 Tracks from that night, ‘I’m Waiting For My Man’, along with Bowie originals ’Toy Soldier’, ‘Silly Boy Blue’, and ‘Silver Treetop School For Boys’ were only finally released by Acid Jazz Records in 2013. ‘I remember a guy at a gig at Bury St. Edmunds, I came off stage at the interval and he rushed over. I thought ‘oh oh what’s happening here’ but he said ‘that man there is going to be the biggest star in the world. Bowie was probably getting about 30 quid that night but he was a star, his charisma just shone out to the audience’. In early May 1967, two months after he first appeared, Bowie was gone. His debut album was released shortly afterwards but it would be two years before ‘Space Oddity’ propelled him to stardom. Whether his last gig was in Leighton Buzzard or Tilbury is unclear but overnight The Riot Squad switched Bass player Brian Prebble to lead vocals and continued with the flamboyant stage act that had been sparked by Bowie’s arrival. Butch remained with the band until a few months before they finally split in the summer of 1969. Post Bowie they recorded with American producer Lee Magid, had sessions for Pye Records and Brian Epstein’s NEMS Agency, were briefly joined on stage by David Essex and Jimi Hendrix (though not at the same time) and by all accounts horrified the audience of Opportunity Knocks, finishing in last place, on account of their ‘obscene freak-out stage act’.